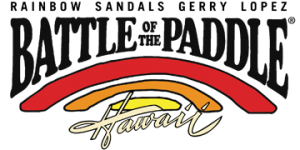 The 2011 Rainbow Sandals Battle of the Paddle, Hawaii, took place the 14 & 15 May 2011 on Waikiki Beach. The main draw at every BoP is the Elite Race, where paddlers race in and out through the waves. It’s become one of the biggest races of the year, and 2011’s Hawaii event brought out a stacked field. Defending champion Danny Ching came in as favourite, after an all conquering 2010 saw him win all four BoP events (both Hawaii and California’s Elite and Long Distance races). But the runner-up from BoP Hawaii 2010, Aussie Travis Grant, pushed Ching all the way and eventually broke free on the last lap. The result was a virtual reversal of the previous year, where Ching & Grant also set an early lead and battled the whole race together, before Ching finally stole a lead in the dying minutes. On the women’s side it was another crazy performance from Candice Appleby, beating the 2nd place finisher (Jenny Kalmbach) by just over a minute and keeping her winning streak intact.